Airports are feeling the pinch from the government shutdown and that includes employees at Nashville International Airport. NASHVILLE, Tenn. (WTVF) — Three federal agencies employ staff who keep planes flying at Nashville International Airport: the TSA, FAA and U.S. Customs and Border Protection. TSA has the most visible job, handling security at the airport. The FAA controls the airspace and staff direct the planes where and when to fly and land. Customs staff have to clear every international passenger who lands in Nashville. This weekend, the TSA reported 10 percent of its workforce called out sick nationwide. That was three times more than the normal amount. So what happens if staff stop showing up to work in Nashville? BNA becomes a glorified food court, said one airport staffer. Right now in Nashville you can still get to your destination. But that's because people like Chris Grimes continue to go to work. He knows government shut downs are always bumpy. "The airport functions 24/7, 365," he said. 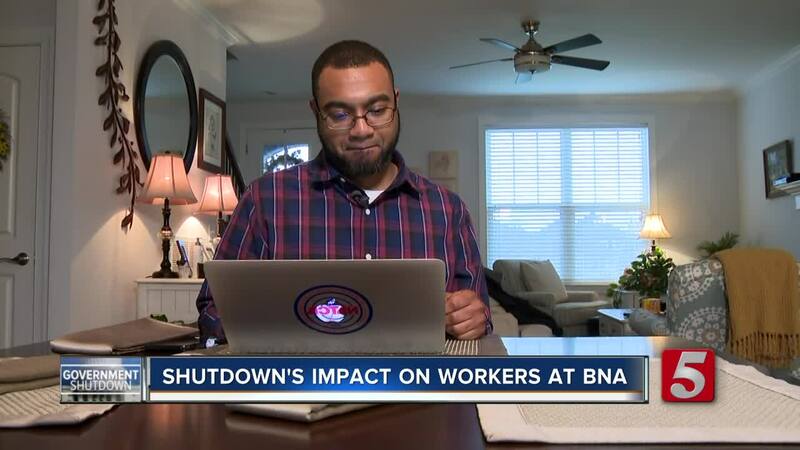 That means the 26 certified air traffic controllers like him and 14 controllers in training have to continue to man both the BNA tower and the control room for the other airports across Middle Tennessee. But this time, Grimes says it's different: there's a greater level of uncertainty. "When that first paycheck was missed I think it made it real for even the folks that had been in it that long (who thought) 'wow I just missed a paycheck,'" he said. And this week he and his colleagues are about to miss another one. Nashville International Airport says so far it hasn't seen any major impacts to wait times or flight schedules. But staff know that could change any day. "It's about people saying 'you've put me in a position where I'm going have to figure out how am I gonna keep the lights on,'" Grimes said, "it's sad, it's a sad state of affairs." Grimes is luckier than many. He has savings and a good family support system. But in a growing city, with a tower already short by more than a dozen certified controllers, the uncertainty has him and others facing a decision they never wanted to make. "I'm doing this because I wanted to retire doing this, but maybe I'm going to need to look at other options," he said. Grimes is also working as the local rep for the National Air Traffic Controllers Association. There isn't one side he blames, saying they're both responsible for ending this. "Safety is non-partisan," he said. For now he says he will continue to show up his usual six days a week, 10 hours a day to keep the air around Nashville safe. Though he says he's concerned after the Office of Personnel Management clarified Wednesday that federal workers can take "furlough hours" as time off, which won't count against their sick or vacation time. Grimes says with that announcement he expects a lot more people to take days off, which could have a big impact on airports across the country. Including right here in Nashville.